Marks and Spencer is currently focused on international expansion and transforming itself into a true multi-channel retailer, but will that drive enough growth to offset its relatively weak dividend yield? It’s an interesting question because, after looking at the company’s history, I think it would take a giant leap of faith to assume it can produce any kind of sustainable growth. With Marks and Spencer’s shares currently trading at 565p, the company’s dividend yield is just 3.2%. That’s slightly below the 3.6% yield which is available from the FTSE 100 (with the large-cap index at 6,800 points). To justify that lower dividend yield, investors must be expecting Marks and Spencer’s dividend to grow faster than “average”, i.e. faster than the FTSE 100’s dividend. Over the long-term, the UK stock market has grown its dividend at around 2% after inflation, or a nominal 4% per year if we assume the Bank of England maintains inflation at 2%. 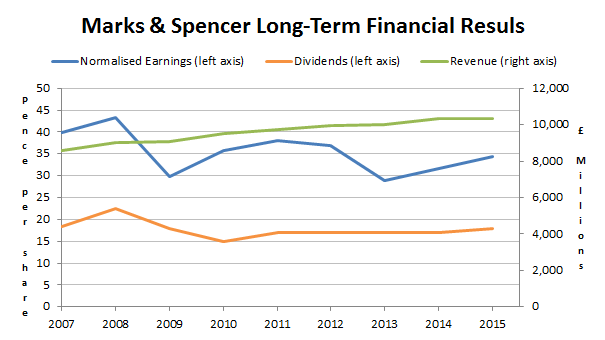 If the market keeps up that rate of growth then Marks and Spencer will have to grow its dividend faster than 4% a year, for many years, in order to justify its current low dividend yield. To me it doesn’t look as if that’s the most likely outcome. The chart below shows just how flat results have been at Marks and Spencer in recent years. Revenues have been climbing, but the per-share earnings and dividend figures have gone less than nowhere. Although Marks and Spencer has produced a profitable dividend in every year, its results are nothing to shout about. Of course, it does have various strategies to drive growth, such as international expansion, its transformation into a true multi-channel retailer (combining online and offline shopping channels), investing for efficiency and so on. But its competitors all have their own strategies for growth, and while Marks and Spencer could turn things around and start producing consistent growth, I see no obvious reason why that will be the case. A company with a history of negative growth is obviously not the most attractive investment on earth, and that’s one reason why the shares need a higher dividend yield in order to be attractive (at least to me). Clearly Marks and Spencer fails the first test. That means I would only invest if the shares were significantly cheaper than they are today, in order to offset the risk that the company is in permanent decline. To be able to grow consistently faster than average, companies typically require some sort of competitive advantage. I like to look for competitive advantages primarily through the return a company can get on the capital employed within the business (ROCE). If a company can generate above average returns on its capital assets such as shops, factories and equipment, there is a good chance it has some sort of competitive advantage. Of the 230 or so stocks I track on my stock screen, the median 10-year post-tax return on capital employed is 10.7%, which I usually round down to 10% and use as my definition of “average profitability”. So how does Marks and Spencer stack up? The answer is – extremely averagely. Up to the 2015 annual results, Marks and Spencer had a median return on capital employed of 10.8%, which is slightly above my ballpark “average profitability” of 10% and just 0.1% above the actual median of those 230 companies. Admittedly, those 230 companies are a solid bunch to start with as they all have a 10-year unbroken record of dividend payments. However, among that group, Marks and Spencer does not stand out at all as being especially profitable. M&S beats my relatively low hurdle for profitability, but it is still no better than average (although at the right price, average can be good enough). Some companies can get by with a few desks, some telephones and little else. This makes growth easy because all they have to do is buy a few more desks and install a few more phones. I imagine this is what it’s like to run a recruitment company. But that isn’t true of Marks and Spencer. M&S has to fit out a new store with (probably) millions of pounds worth of shelves, checkouts, cash vaults and facilities for staff. Even its transition into a multi-channel retailer has required the construction and fit-out of a highly automated distribution centre at Castle Donington, costing many millions of pounds. Because it’s easier for capital-light companies to grow, I always check how much a company spends on capital expenses (capex) as part of my “value trap” analysis. In Marks and Spencer’s case, over the last decade it has invested more than £6bn into capital assets, which is more than it earned in pre-tax profits. That makes it a relatively capital intensive business, where growth and even survival requires large amounts of investment. That’s fine, but sustaining growth in those sorts of companies, especially those that generate “average” rates of return on capital employed, can be a hard slog. Currently Marks and Spencer has just over £2bn of interest-bearing debt. That is approximately 3.7-times its average post-tax profit over the past 5 years, where that average is £550m. M&S does pass this test, but a Debt Ratio of 3.7 is not a million miles away from 4, so by that measure the company has fairly substantial debts. That might have been okay on its own, but Marks and Spencer also has another, far larger financial obligation in the shape of its defined benefit pension scheme. The pension scheme’s liabilities are currently just over £8.1bn, which is almost 15-times greater than the company’s average earnings over the last 5 years (of £550m). Although the scheme is currently in surplus (i.e. its assets, at £8.6bn, are greater than its liabilities) it still represents a significant risk. If the value of the assets, which are primarily government bonds, were to fall (i.e. if interest rates rise) then the fund could easily end up with a small deficit. But with an £8bn pension fund even a 10% deficit would mean an £800m black hole into which the company would have to funnel cash. Because of this large pension scheme, I would only consider investing in Marks and Spencer at the moment if its shares were outrageously cheap. By adjusting a company’s share price until it ranks in the middle of my stock screen, I can estimate their “fair value”, and at the moment fair value for Marks and Spencer appears to be around 450p. At 450p, Marks and Spencer would have a 4% dividend yield, which is slightly better than the FTSE 100’s 3.6% (with the large-cap index at 6,800). I think that would be a fair dividend yield for a company that shows no obvious signs of having market-beating growth potential. 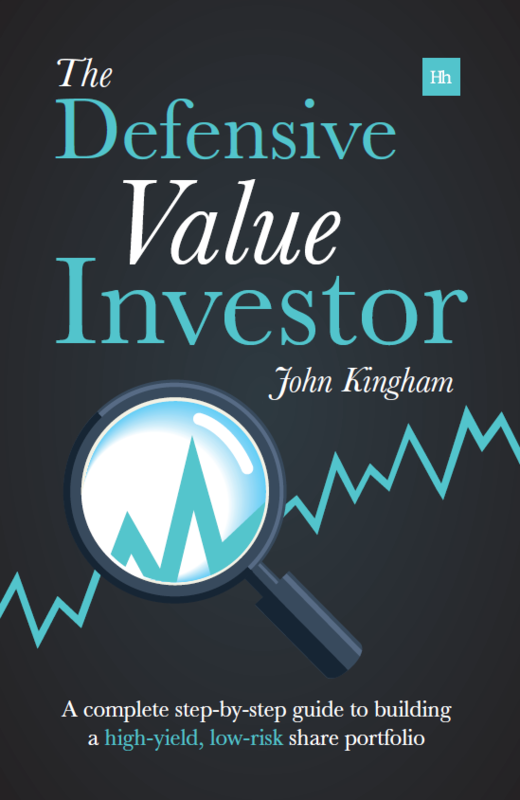 However, in order to beat the market you have to buy shares below their fair value, otherwise all you’re likely to get is the market rate of return, and you can get that with a passive index tracker. So for Marks and Spencer, my “buy price” for now would be around 300p. That would make it a top 50 stock on my screen and would also give it a dividend yield of 6%. That may sound like an excessively high yield, but it’s the sort of compensation I would need before investing in such a low growth company. I would not invest money into M&S shares at the moment but do hold a few that I got while working for them. As I have been getting a dividend for last 15 years they care just pure profit for me. Hi Paul, if a steady dividend is what you want then M&S is probably a reasonable stock to hold onto. However, one of my main goals is to beat the market, so that’s why, at its current price, it’s not for me. That’s funny, because I bought a few M&S shares last year when they were around your target price; from what I remember I even said it here. I have sold two-thirds by now, but I am going to keep the rest. I always have a few companies on my turn-around list and M&S is still there. M&S is certainly improving at this moment and I expect this to continue. There is a bit of disposable income going round and a bit of pension funds resulted from the pension flexibility and I believe a few of those funds will be spent online or in an M&S shop. We shall speak again whey they breach above 600p and stay there for a while, probably next year. Hi Eugen, yes they went as low as 380p last year, but never quite low enough for me to invest. They have just finished the bulk of their “turnaround” capital investments, so the company could have a good run, but that positive view all seems to be in the price already. Obviously that some positive news is priced in the stock price. However I do not think, they are priced at the level they should be. There are a few things that were not even well understood by all investors, that clothes sales have turned a corner, but this in not reflected in the last annual report, because it happened afterwards. Second M&S will bring in a loyalty card in the UK, but not similar with Tesco’s. I believe this would be very helpful. The expansion in China goes well and once the e-commerce Chinese website is up and running, every corner of China could benefit from a great brand. I could say that if a new global recession is not coming around in the next 5 years, the £1bln profit from 2007 could be reached again by 2020 by M&S. For me the biggest worry is not the interest rate increase, it is a possible fall of output in China. In my opinion the change for a country, from an industrial country to a country that favours consumer goods and services, could not be done without a little economical crisis. So I believe it will be the same for China. This is the type of event that Nassim Taleb explained in his Black Swan and Antifragile books. This could be a successful trade that someone could make it only once in 10 years time. I checked my portfolio the other day and I found out that I am quite exposed to a possible Chinese crisis. I own lots of stocks that could be affected badly: Diageo, Boeing, Japan Tobacco, Apple, Samsung, some little BHP Billington, even a bit of M&S, but others as well. So I decide to hedge myself and buy put options on the Chinese renminbi to make a profit if the Chinese currency will devalue their currency against the USD. The options premiums were so cheap (the renminbi did not devalue against USD in the last 10 years), so the trade was a no brainer. Marks and Spencer’s shares might not be the most attractive opportunity for investors. But what about investing in a portfolio that consists of ETFs? When your capital is evenly spread among multiple stocks, bonds, industries and countries, it gives you certain peace of mind. At least, you won’t lose everything you earned overnight. 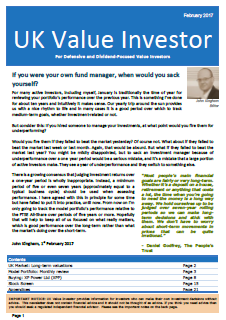 For most people who aren’t that interested in investing, a basket of passive ETFs is the right sort of approach. But for those of us who want to get better returns than passive investors, investing in companies like M&S is (at the right price) a good and enjoyable alternative. M&S have only ever featured in my peripheral vision of occasions. In general, retailers–especially of fashionable as opposed to staple items (though in the latter category, Tesco has hardly been a star performer! )–I find unattractive. As you say, they are capital intensive. But also, they suffer from the whims of fashion (and the company’s ability to tap into them). This M&S have struggled to do (in contrast to, say, Next) even though they are clearly turning a corner in this regard. I think their international expansion plans are pretty brave and potentially lucrative. It is clear the M&S brand as an iconic British company has a lot of brand clout overseas. However, again, capex is required to grow in order to bring this about. Sitting at the side to see how things pan seems pretty solid to me! Hi DD, well if the company does start to perform over the next few years then of course “fair value” and “attractive value” will increase, so a fall to 300p may not be required. For now though, with its zero-growth history, that’s all I’d be willing to pay. however, I hope the company does do well because I’ve always bought most of my clothes there and the ladies (it’s almost invariably a woman) at the checkout are much nicer (on average) than at other shops. That’s just my anecdotal view, of course. I certainly don’t see them disappearing from the retail environment. They have not necessarily done anything wrong which endangers their existence, only their growth really. I agree, the shopping experience at M&S tends to be very good. Edging up towards John Lewis-esque kind of atmosphere. I know from personal experience that Miss DD has found more in M&S of late that catches her eye. In the past, less so. that is a positive thing. That being said, the king of the DD household remains Next at present. Warren Buffet once said that: if past history was all there was to the investment game, the richest people would be librarians.